CTI’s ATM placements increase traffic and build customer loyalty, and our profit sharing plans are unparalleled in our industry. This no maintenance/no cost approach is an incredible income generator for today’s business owners. We constantly monitor our machines from our central data center which means maximum uptime and maximized profits for you. Our approach allows you to spend time on what matters most – your customers. CTI is dedicated to your success. Our flexible and efficient solutions are designed to integrate with your business seamlessly. Our professional staff has the know-how and experience to help you achieve your goals. In today’s marketplace, competition is fierce. Customer loyalty isn’t as easily attained as it used to be. CTI provides the tools and resources to satisfy your customer’s needs and keep them coming back for more. ATMs allow your customers to access their available cash from check cards, credit cards, and debit cards. When customers have more money, they spend more money. Due to studies done, 10%-20% of the money withdrawn from an ATM is spent in that business. Giving your customers the convenience of an ATM benefits you in three ways, the first being the money you make from the revenue from each transaction done, second is the money they use in your location for purchases, and third is that customers are going to come to a location that better conveniences them (keeping them from going to your competition). Financial institutions interested in adding low-cost solutions to increase their footprint on the marketplace need not look any further. A co-branded CTI ATM will gain valuable exposure to prospective clients and existing customers alike. We implement customized campaigns designed to achieve your goals in key demographics. Outsourcing with CTI will reduce operational costs and free up valuable time. CTI specializes in ATM profitability. We have the experience to pull struggling machines from the flames and turn them into mega profit centers month after month. We manage, service and replenish the ATM while you reap the rewards. Appearance is everything. Our custom kiosks will fit seamlessly in any setting. Each cabinet is custom made to specification by skilled craftsmen. From opulent opera halls to private resorts, we can create an ATM kiosk which will be unobtrusive and easily mold with existing décor. 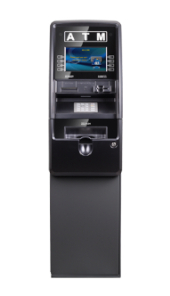 An elegant ATM solution is a call away with CTI. A picture is worth a thousand words, or so they say. Advertising on a static medium which already captures the attention of 90% of American makes sense. CTI offers full color graphics which grab attention while generating income. CTI works closely with seasoned graphic artists to deliver custom eye catching themes. Get noticed, the CTI way.